Note: This is an older edition of the Best Climate Practices Award. All information about the current edition of the contest is available on the Award Section of this website. Finance is one of the key elements for driving climate action and implementation in 2016 and in the years ahead. After the Paris Agreement, which has set a long-term path towards emission reductions and adaptation measures, the international community, governments and private sectors are called on to transform their climate pledges into meaningful actions and gradually increase the current mitigation and adaptation efforts, also by providing adequate funding. Billions of dollars were pledged by national governments, multilateral development banks and multilateral climate funds right before and during the COP 21 UN climate change conference in December 2015, where the wealthier countries also committed themselves to extending their financial pledge of providing USD 100 billion in 2020 for an additional five years. However, the key challenge in the next few years will be to efficiently match on a local scale commitments and contributions with actual needs and plans. Even though on a global level the momentum is building up, climate finance will require further steps and developments to trickle down effectively from the top to the base of the pyramid and reach those micro and small-scale entities, as well as the most vulnerable populations, that are often unable to access proper financial products and services. According to the World Bank, some 2 billion people worldwide remain without bank accounts, despite a 20% drop in the figure since 2011. The problem of limited access to finance is most acute in the emerging and developing economies, but low income populations and small enterprises face similar barriers even in the richest countries. In recent years digital technology, the spreading of telecommunications and non-traditional models (such as micro-finance and crowdfunding) have been crucial elements in cutting a new path towards innovative, non-conventional and more inclusive financial services, which involve, for example, mobile and internet technology, peer-to-peer lending, micro-insurances, cloud services, social media and big data application. Advances in technology, increasing global awareness and efforts are driving substantial progress worldwide. Creativity and innovation are essential for helping to develop alternative ways and best-suited tools to raise funds and bridge the gap between climate-related financial flows and those potential beneficiaries who need it most: individuals, micro-, small-and medium sized enterprises. The Best Climate Practices 2016 Award aimed to showcase ideas and projects designed to raise and drive financial support toward local, small-scale mitigation and adaptation actions (including but not limited to: clean energy, land management, sustainable farming, climate risk reduction and resilience building) and/or to increase inclusiveness and simplify access to climate finance (addressing, for example, investors’ risks, transparency, predictability, flexibility or accountability issues). The 2016 edition featured 14 shortlisted candidates from all over the world. Zaheer Fakir is Chief Policy Advisor for International Relations and Governance at the Department of Environmental Affairs of South African Government. He serves as Co-Chair of the Board of the Green Climate Fund, the UNFCCC entity devoted to mobilize funding to low-emission and climate-resilient development in developing countries. Zaheer Fakir is also a member of the World Bank’s Clean Technology Fund. In his previous appointments he also served on the Global Environment Facility Council and on the Kyoto Protocol’s Adaptation Fund Board. Prior to his current position, he worked as Economic Representative for the Embassy of South Africa before having served as Chief Director of International Relations and Governance at the Department of Environmental Affairs from 2007 until 2010. Alejandro Kilpatrick works as a Team Leader of Finance, Technology and Capacity-building Programme at the Secretariat of the United Nations Framework Convention on Climate Change (UNFCCC), which supports the intergovernmental process as regards to international cooperation on the mobilization of financial resources, technology development and transfer, and building of individual, institutional and systemic capacity to enable Parties to take enhanced action on climate change. Prior to joining UFCCC in 2011, Alejandro Kilpatrick worked for the Global Mechanism of the UNCCD (United Nations Convention to Combat Desertification) as Programme Coordinator for Latin America and Caribbean (LAC) and Climate Change Programmes, which facilitate access to funding from climate change financial mechanisms for the areas most affected by land degradation and desertification. Also he worked close to four years for the United Nations Environment Programme (UNEP) regional office for Latin America and the Caribbean on several environmental issues including the Montreal Protocol, cleaner production, biodiversity and land degradation. Nick Robins is co-director of the UNEP Inquiry into the Design of a Sustainable Financial System, an international initiative to advance financial policy options that more effectively mobilise capital for an inclusive, green economy. Nick Robins has over 20 years’ experience in the policy, research and financial dimensions of sustainable development. Before joining UNEP, he was Head of the Climate Change Centre of Excellence at HSBC in London from 2007 to 2014, where he produced investment research on issues such as clean tech growth, climate vulnerability, green stimulus and stranded assets. In the Thomson Extel awards for European investment research, Nick was ranked as #1 analyst for integrated climate change in 2009, 2011, 2012 and 2013. Prior to HSBC, he was first head of SRI research and then head of SRI funds at Henderson Global Investors. At Henderson, he published the first ever carbon audit of an investment fund and co-designed the Industries of the Future fund. Nick Robins has also worked for the International Institute of Environment and Development, the European Commission’s Environment Directorate and was part of the original Business Council for Sustainable Development working on the Changing Course book for the 1992 Earth Summit. 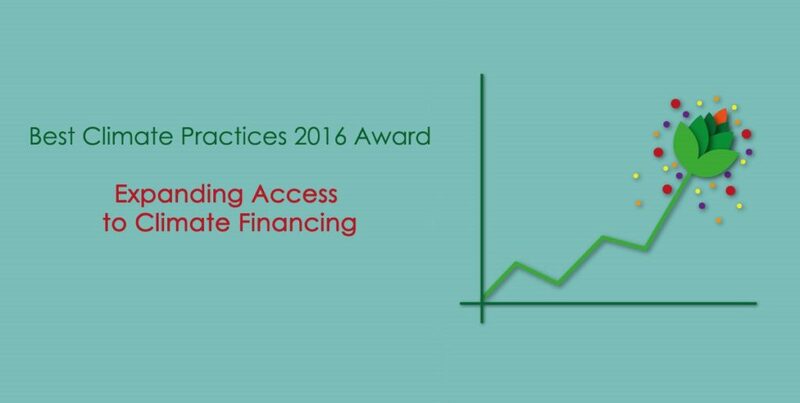 The prize of the 2016 Best Climate Practices Award is 3000 euros (*gross amount subject to withholding tax). Moreover, the Award promotes the winner and other deserving projects in competition through its communication channels and initiatives. The 2016 Best Climate Practices Contest awarded the prize to two winning projects and a special mention to two other very innovative projects. Among a diverse set of 14 remarkable contestants, the jury’s choice was motivated by the will to award two active and operative entities implementing microfinance strategies that have proven their capacity to deliver concrete results in climate-vulnerable developing countries. The two 2016 Best Climate Practices winners split the prize equally as a contribution to their activities. The jury also accorded special mention to two other projects for their high potential to improve access to, and inclusiveness of, climate finance. A special mention was accorded to Fair Climate Fund, a Dutch social venture operating in India and Ethiopia. The Best Climate Practices jury agreed that the project deserved recognition for its capacity to link different sectors and countries, and for the scalable potential of its innovative “FairTrade Climate Standard”, currently involved in a pilot phase. A second special mention went to the “Matchmaker” project, developed by the French Low Carbon City Lab programme (LoCaL, Climate-Kic), for its systemic, smart approach to targeting the key sector of urban climate finance. The winners were awarded on November 28, during a special event organized by FEEM in Milan.